I will post about the race today and our trip tomorrow. First off, I want to say how proud I am of my wife, Kim. She completed a marathon that most runners can only dream of being able to run. She didn’t get the time she wanted, 3:30, but it was warm for running and there was a head wind. Even the winners had slower times than expected. The commentators kept asking experts why do you think the pace is slow today. The winning male was 2:12 and female 2:29. Pretty slow to me lol. However, her time of 3:46 did qualify her to run it again next year if she decides to. Most of my comments will be from my wife obviously, since I did not run it, but I will add my two cents here and there. Kim loved the athlete village and the corals. She felt like it was much more organized than NYC. 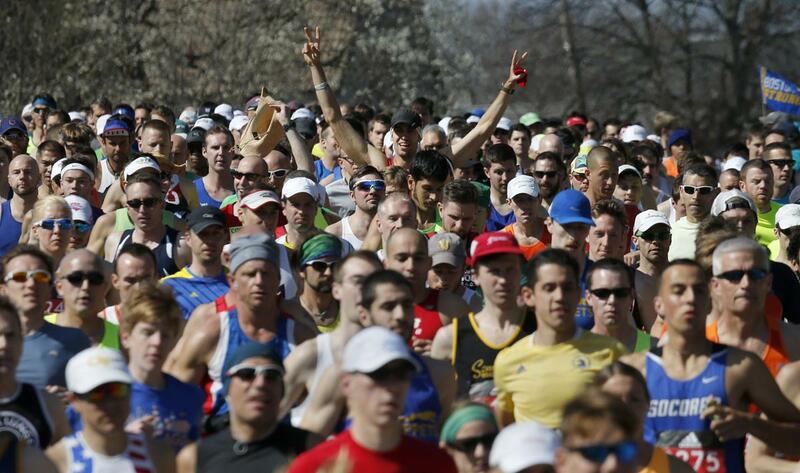 Maybe that was because there is half the amount of runners as in NYC. She felt the course was more congested than she thought it would be. Since a lot of it are on two lane roads going through neighborhoods, she felt for the first half she was constantly having to hold her arm out to keep from running into people or them running into her. Several times her feet were clipped by other runners but, luckily, she did not fall. Below are the winning push rim (wheelchair) for male and female. The men’s race came down to the last few feet. What an exciting finish. The male winner,Marcel Hug, defended his title by less than a second. The female winner, Tatyana McFadden, won by a minute and fourteen seconds. Below are the winning men and women about 100 yards from the finish. If you did not see the race it was crazy. The winning women, Atsede Baysa, was 37 seconds back at 35k. In the last 4.5 miles or so she made up that 37 seconds and passed the two leading women at mile 24 and won by 44 seconds. Do the math, in the last 4.5 miles she was running about 19 seconds per mile faster than the leaders. Crazy. The men’s winner, Lemi Berhanu Hayle, was equally impressive pulling away in the last two miles. Mile 24 was a 4:56 pace. Only in my dreams. Put your treadmill on 12 and try to run as far as you can. He was going faster than that….. for longer. The congestion affected her time first 5k time (8:06 per mile) was about a minute off where she needed to be to finish at 3:30. Her 10k split time was a little better. Through 10k (6.2 miles) she had improved to 8:03 per mile for this 5k section. She kept improving and her 15k time she was 8:01 per mile. She slowed down for the next 5k and her 20k time she was at 8:08 per mile for that 5k section.. At the half way point she was at 1:45:42. ( 8:03 pace) and was only about a minute and half off her goal for 3:30. Not bad considering the congestion but she still had the hills to go. Might I add she was also pretty consistent for every 5k. She said the crowds at Wellesley College were crazy. The crowd noise was so loud she couldn’t hear her music but it was inspirational. A good pick up of encouragement. She slowed down for the next 5k section and averaged 8:26 per mile at the 25k mark. She then hit the hills of Newton for the next 5k and averaged 9:02 per mile. She then hit the section with Heartbreak Hill and averaged 9:34 per mile for 30k to 35k. She said by that point it felt like her quads were going to fall off. She stopped and applied leg cramp creme that they were passing out. By this time they were running into a head wind and Kim was sick of running in wind. For training it is all we had. I think she mentally checked out and walked some. Her next 5k time to get her to 40k she averaged 9:43 per mile. She picked it up to the finish line and did the last little bit at 9:16 per mile and had an overall pace of 8:39. This was 40 seconds per mile off what she wanted to be at to finish in 3:30 but she is happy with her time. She finished and wasn’t injured. And still qualified for next year. She really isn’t hurting or sore now. She seems to be in good shape and knowing her like I do, she is probably itching to go for a run. It is hard for her to stop and rest. I have to keep reminding her that even the best like Meb and Shalane and Amy Kragg all take two to three weeks off after running a marathon. I can’t imagine Kim ever taking three weeks off, she would go bonkers. Overall, it was an enjoyable event for our family. We had beautiful weather. I wish there were more places we could have seen Kim during the race but that just isn’t possible with Boston Marathon course. I know this was a lot of running jargon with pace per mile and split times and all that but I hope you enjoyed reading about Kim’s race experience. Thank you Yes the pink helped a lot. NYC she wore a light gray and it was hard to spot her. Pink was easy.